The host of Showbiz Agenda on Zylofon 102. 1 Fm and Head of Communications at Zylofon Media Samuel Atuobi Baah popularly known as Sammy Flex have finally responded to the countless social media criticisms. 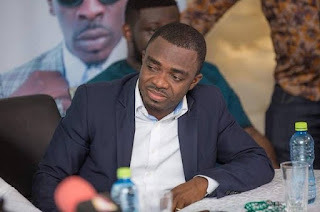 Since Saturday, Feb 10, CEO of Zylofon Media Nana Appiah Mensah’s head has been on the chopping boards of social media users and even some media men following a tweet he posted in honor of the late dancehall diva Ebony. As the criticisms got heater, Nana Appiah Mensah fondly called NAM 1 has issued a statement to calm down tempers as he is preparing to clarify his tweet on live radio on Monday, Feb 12. NAM 1 as promised, came on Zylofon 102.1 Fm yesterday to clear the air about his tweet that he meant no harm, he was just paying tribute to the late singer based on his last encounter with her. Right after his interview, Sammy Flex has become the next on the chopping board as he is been accused of disrespecting the former manager of Ebony, Bullet with a comment he made on radio. The above comment by Sammy Flex didn’t go down well with Bullet and others who came hard on him to render an unqualified apology to Bullet. But Sammy made it clear today on his Showbiz Agenda show that he owes bullet no apologies and rightly so. Interestingly Sammy Flex has finally shared his views on the whole trolling, according to him he’s not perturbed by all the comments coming at him whether good or bad, he rather showered blessings on all who mentioned his name in their posts.